Due to the enormous success and tremendous demand for our Junior Program last year, we are excited to announce that in addition to our six week SUMMER PROGRAM we will be adding a second 6-week FALL PROGRAM in 2019. We are offering 4 sessions (age specific this year), beginning the week of July 8th, and running consecutively for Six weeks. Each session will be capped at 16 registrants, to ensure maximum instruction time. We expect, based on last years feedback and recent interest, these slots will fill up very quickly. Don’t get shut out ! Due to popular demand, we will also offer this season a Fall session, beginning in early September. Dates will be announced mid August, if this may better meet your needs. Cost of this years clinic is $ 190.00. Make checks payable to Green Harbor Golf Club. Thank you all for your interest, and we hope to see you this summer !! Juniors will receive on-course playing experience with a PGA of America Professional, Top 50 rates US kids instructor. Lessons will include golf etiquette and rules. Young juniors will have high school golfers play with them. 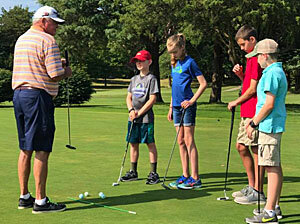 Private lessons and other group lessons are available for beginning golfers and others seeking additional support for their game.